We have worked on a number of historic and listed buildings that are no longer needed for the use that they were intended, as is the case at two of our current projects – Boston Sessions House and Bourne Town Hall. These large imposing former court-houses have been unoccupied for a number of years, making them very vulnerable. Converting a heritage building into a viable and sustainable use that is commercially viable, whilst keeping the character for which it was intended, can be challenging. One of the best ways of finding a new use can be achieved through a Viability Appraisal – broadly speaking, a Viability Appraisal works out rough costs as well as different options for the building. As well as development costs, there are likely to be repair costs, these heritage assets are very often in poor state of repair and need a condition survey to identify the extent and costs of the repairs. To physically change a building usually leads to an ‘uplift’ in value, however often with historic buildings there may be a ‘conservation deficit’ and a Viability Appraisal will allow you to work out what that shortfall figure may be. A Viability Appraisal identifies potential end uses, whilst taking into account the importance of the building and site. In many cases there will be a preferred option based on historic value and the financial sustainability of the option, working on broad outline costs and end value. A Viability Appraisal is a team effort. We work with Heritage Consultants to provide historic research, RICS Valuers to provide outline costs and Property Valuers to provide ‘before and after’ valuations based on our design options. Very often the appraisal can be funded through a ‘Start-Up’ Grant and once complete can be used to open up options for funding streams and is particularly useful for gaining support from stakeholders and the local community. 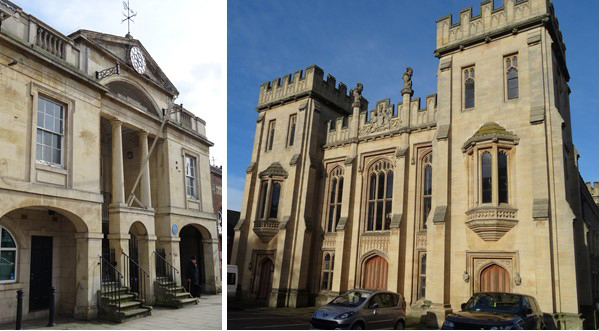 left: Bourne Town Hall is a Grade II listed grand former court-house, in Bourne. It is of special architectural interest with a number of notable features. right: Boston Sessions House is a Grade II* listed fine example of a former justice court in Boston. It is of special architectural interest due to its very complete interior.